Casa Morello is a five bedroom Premier Villa set off a country lane amidst open countryside affording magnificent views to distant mountains. Country loving walkers can ramble along winding country lanes and enjoy the fresh air. 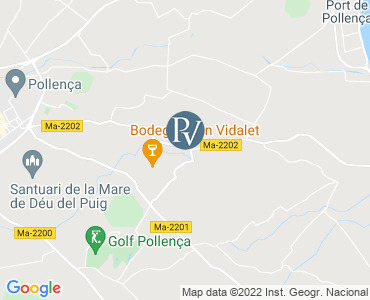 For cyclists this is ideally located to start your tours in this undulating countryside, an easy ride within a few minutes to the sandy beaches of Puerto Pollença. Electric gates open to the driveway with a covered parking area. Brush fencing and conifers surround the magnificent gardens ensuring privacy. This impressive, country property has terracotta coloured walls and is furnished to a high standard. Carefully planned and designed to provide large families or groups with both space and privacy. Free air conditioning for 24 hours in all bedrooms and the main house and poolside casita have central heating for March, April and October as needed. The main entrance leads into the open plan living area, with comfortable seating, TV (English, German and Spanish channels), DVD player, complimentary WiFi, and music system. Separate dining room with doors to the gardens and poolside terraces. Fully fitted kitchen with many modern requirements including marble worktop electric oven, gas hob, large fridge/freezer, microwave, eye-level fitted cupboards and doorway to the gardens. Double bedroom with fitted wardrobes and separate full bathroom with walk-in shower, located off the lounge area. The first staircase leads to a double bedroom with pool and garden views. Twin bedroom with fitted wardrobes. Shared full family bath/shower room. From the other side of the lounge is the second staircase leading to the Master double bedroom with en-suite bath/shower room. Twin bedroom with en-suite shower room. Both these bedrooms have access to a large sun terrace with beautiful views of the Mediterranean gardens, swimming pool and verdant countryside. Adjacent is the full open plan kitchen with electric oven, gas hob, fridge freezer, dishwasher and glass sliding doors to the pool and gardens. The Gas BBQ together with the original Mallorcan bread oven is set on a terrace located next to the summer kitchen over looking the swimming pool. This is a setting for many memorable family alfresco lunches and dinners. For your added convenience is a guests shower room/wc. A very special feature of this villa are the colourful gardens with ancient olive tree, an array of majestic palm trees, red and white hibiscus (Birds of Paradise) and scented herbs. Another special feature is the enchanting Japanese style wooden bridge over a covered pond with water lilies. Please note this feature is fenced off for safety. The infinity swimming pool has Roman steps, waterfall feature and wooden decking surround. The sun terraces are furnished with reclining sun loungers and adjacent grass areas, so plenty of space for children to play. The BBQ area also features an ornamental Mallorcan oven. This separate area also has various farming implements and multi-coloured terracotta and ceramic pots. From the terraces are far reaching views towards Puig Maria and distant mountains. Pool towels and table tennis are also provided. This is a truly wonderful family holiday home and highly recommended. All prices are per week for the villa only. Villas are booked from 15:00 on your arrival day to 10:00 on your departure day. Please note that availability shown is subject to confirmation - please call our reservations team on 01243 514970.